igrice-igrice.net website is suitable the visitors over 13 year age, the younger visitors are suggested to use its service and games together with their parents. Most of the published games are submitted or suggested to us by their creators, proprietary rights owners. igrice-igrice.net can not confirm if they have respected the others intellectual properties or rights. Upon receiving notification in accordance with any related copyright organization or owner, igrice-igrice.net will immediately disable and remove games in question. igrice-igrice.net does not accept any responsibility about the websites which are linking to our website and the outgoing links in the games published at the website. 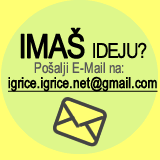 igrice-igrice.net does not accept any responsibility about the advertisements which are published at the website.